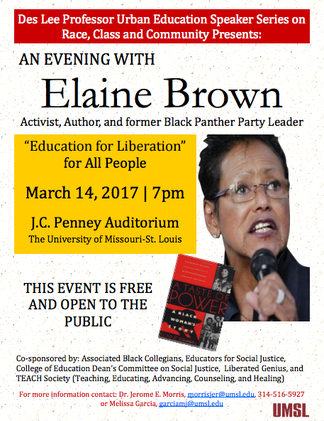 Elaine Brown, the former chairperson of the Black Panther Party, will deliver a presentation entitled "Education for Liberation" and serve as the Inaugural Speaker for the Des Lee Urban Education Speaker Series on Race, Class and Community. Co-sponsors: Associated Black Collegians, Educators for Social Justice, College of Education Dean's Committee on Social Justice, Liberated Genius, TEACH Society (Teaching, Educating, Advancing, Counseling, and Healing). On Friday March 3, 1:00-6:00pm, Keynote Speaker Chai Feldblum will discuss "Protecting LGBTQ+ Progress in Challenging Times." 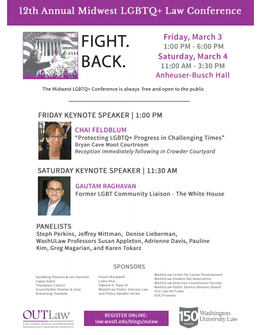 On Saturday March 4, 11:00am-3:30pm, Former LGBT Community Liaison at The White House, Gautam Raghavan, will deliver a Keynote Speech. 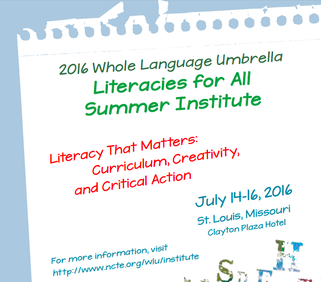 ESJ will be presenting at NCTE's WLU Literacies for All Summer Institute on Saturday, July 16, from 9:30-11:45am. If you're attending the conference, please come to our symposium on Critical Conversations about Race, Power, and Education in our Schools and Communities.